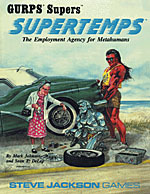 The complete background history of Supertemps – the company's goals, organization and hiring practices. GURPS Supers – The definitive GURPS Third Edition sourcebook for superpowers and the supers genre. GURPS Supers (for GURPS Fourth Edition) – A comprehensive playbook to the supers genre and to capturing it in your campaign.